The loop around fantastic Jenny Lake gives you a great mix of views, creeks, a waterfall, and excellent moose habitat. Head north along the east shore of the lake as it follows the shoreline through the trees. All along the way, views of the lake are backdropped by the incredible Tetons. Trees do partially obscure many of the views but frequently open up to the stunning vista. There is an overlook along the trail that is accessible by vehicles traveling on the Jenny Lake Scenic Drive. This area can often be busy with visitors. The trail continues past the overlook with occasional views until it opens up into an old burn area toward the head of the lake. The trail follows along the stream that connects Jenny Lake and String Lake, crosses it, and heads back down to Jenny Lake. As you travel along the north shore you have fantastic views of the lake. The trail enters into a cool, dense forest, crossing many feeder streams as it approaches the boat dock area. From the dock, work your way up Cascade Creek as it cascades through a pleasant forest. The network of trails in this area can be a bit confusing, so pay attention to the signs and follow them to Hidden Falls. Cross a bridge where a short spur trail takes you to the base of the lovely Hidden Falls. After the falls, continue on the trail as it begins to climb up a trail hewn from the rocky cliffs. The trail is fairly wide, but features steep drop-offs which may be too much exposure for those with a fear of heights. Head back down and cross the bridge and past the Hidden Falls Spur Trail. Stay on the south side of Cascade Creek as you follow the signs down to the Jenny Lake Loop Trail. The trail quickly arrives at the shoreline. As it heads south, it spends much of its time looking east over the picturesque lake. Shortly after the trail leaves the lake’s shore at the southern end, take the spur trail for Moose Pond. Aptly named, the ponds and surrounding willows are prime moose habitat. It is common to see moose feeding in the murky waters of the ponds. (For your safety and the safety of the animals, always make sure you keep your distance from these seemingly docile animals.) 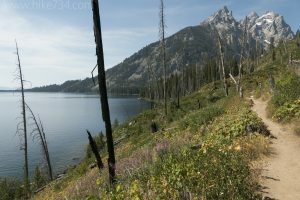 Return back up to the Jenny Lake Loop Trail and take a right to continue on the loop. The trail parallels the shoreline once again, alternating between filtered and open views of the lake. Just before crossing the bridge at the outlet of the lake, take the spur trail out on a peninsula which gives you incredible views of the lake and the majestic, jagged Tetons. Return to the trail, and continue across the bridge, passing the boat dock, back to the visitor center parking area. Trailhead: Head west towards the Jenny Lake Visitor Center at the South Jenny Lake Junction and turn right into the Jenny Lake Visitor Center parking area. 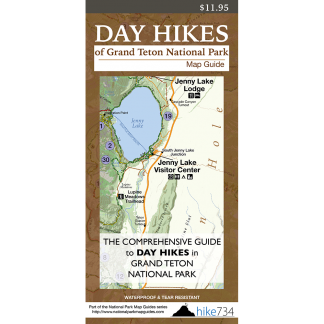 Head to the Jenny Lake Trailhead at the west end of the parking lot.